Having already established its stance in both the automotive and industrial sectors, lead acid battery market in the recent years, has been gaining exceptional importance, given that the product is extremely reliable and cost effective for critical power supply applications. Considering the environmental benefits of lead acid batteries, several end-use companies and regional governments have also shifted their focus toward the development and implementation of this product for various applications. Recently for instance, the Department of Energy’s Argonne National Laboratory has inked an agreement with 14 members of the Advanced Lead Acid Battery Consortium to leverage advanced X-ray technology to increase the potential of lead batteries for various applications. Reports reveal that by using the X-ray beam technology, the governmental body and the investigators will be benefited with in-depth understanding of the chemical interactions inside a lead battery while it charges & discharges. Apparently, this would help the mass commercialization of the lead acid batteries in electric vehicles, energy utilities, and smart phones, eventually driving lead acid battery market trends. Despite the growing investment scenarios in the lead-acid batteries, it is imperative to mention that the global lead acid battery industry has fallen behind the competing technologies of lithium-ion batteries – that have captured a massive chunk of more than 90% of the overall battery market for stationary energy storage. The high energy density and fast charging potential of lithium ion batteries have made them a good match and a product of choice in the rapidly proliferating business sphere of electric vehicles and power grid, which has significantly brought down on the costs of these batteries. Indeed, lithium ion battery market held a valuation of over USD 24 billion in 2016. Lead acid batteries still have huge potential as they do not pose the same explosion and fire risks as that of the lithium-ion batteries, in turn making them more reliable for stationary power grid, and automotive applications. 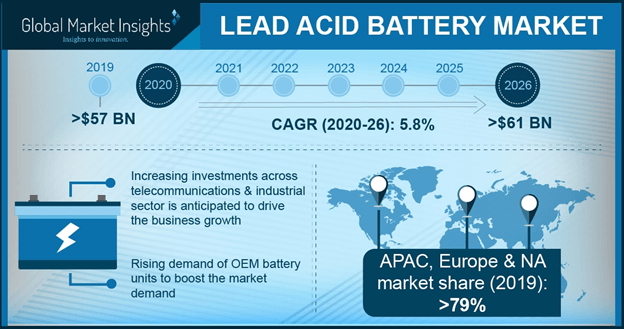 Owing to the increasing focus toward improved power quality, the stationary lead acid market, according to reliable estimates, is projected to record a y-o-y growth of more than 5% over 2018-2024. The stationary lead acid batteries, for the record, find prominent applications in the energy utilities, backup power, renewable energy systems, emergency lighting, railway backup systems, security systems, and O&G explorations. Speaking along similar lines, another important investment ground for potential stakeholders is the SLI lead acid battery industry. Given the globally increasing automotive sales, SLI lead acid batteries are catering to the increasing demand of vehicles with the start-stop functionality and micro-hybrid systems. Accounting for more than USD 25 billion in 2017, this segment of the lead acid battery market is expected to garner lucrative proceeds, owing to its growing prominence as a means to lower carbon emissions in micro-hybrid vehicles. On this note, it is prudent to mention that more than 99% of the passenger cars in Europe, as of 2017, were operated on lead acid batteries, courtesy - Battery Council International (BCI). Lead has been further considered as the most effectively recycled commodity metal, and the lead acid batteries in this regard are the only energy storage systems in the form of batteries that are almost 100% recycled. Reports claim than around 99% of lead batteries are collected & recycled in the United States and Europe. Elaborating further, the Europe lead acid battery market has in fact outpaced the annual sales of more than 9 million units in 2017, and is further expected to propel the regional landscape subject to the growing investments and regulations pertaining to renewable power generation, green transport, and emission reduction targets. Considering the environmental benefits of these batteries, the renowned giants operating in the global lead acid battery market space have been indulging in product innovation and technological advancements, in compliance with energy and GHG emission targets, which would in turn have a powerful impact on the future trends of the overall industry expansion. From a valuation of USD 50 billion in 2017, a report by Global Market Insights, Inc., forecasts lead acid battery market to surpass a remuneration portfolio of USD 75 billion by 2024.